If you want to survive in the world, you have to challenge yourself and make yourself better. 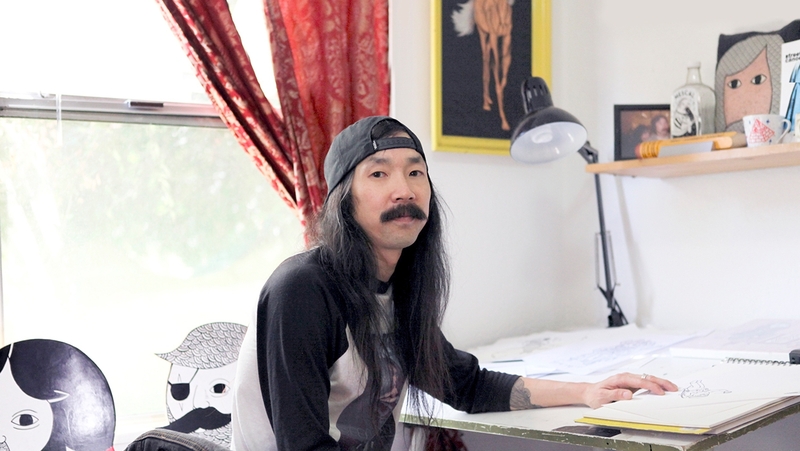 Michael C. Hsiung is an artist, freelance illustrator and lifelong dreamer known for humanizing mythical creatures—imbuing unicorns, narwhals, centaurs and slightly overweight, beer-drinking mermen with the human condition. You can see his creatures at art shows, in ’zines, on skateboards and on people’s bodies (they’re a popular inspiration for tattoos). Although he now makes his living entirely through selling art to collectors and collaborating with brands, it took Michael nearly 30 years to realize his calling. Michael grew up in LA’s Chinatown and then the neighboring San Fernando Valley, where he and his sister Pearl—also a successful artist—existed in a fantasyland of their own creation. They would draw food and serve themselves paper dinners. “She would draw an egg and some bacon, and wrap it in Saran wrap so we could play with it,” he recalls. “We even did our own Garbage Pail Kids, called the Rubbish Junk Kids.” Michael didn’t do the drawings—he left that to his sister. Nonetheless, he kept a sketchbook throughout his childhood and teenage years, but never showed anyone the contents because it was all “really embarrassing things. Comic book inspired self-portraits. Girls.” He skated, became friends with other skaters and started making ’zines on his dad’s copy machine. Then, around the time his sister went to art school, Michael started to feel anxious about his own path. “I felt like, if you know you can draw, then that’s your identity. But I couldn’t draw in a realistic way. I didn’t know what I was good at.” He quit drawing entirely, stopped skateboarding and enrolled in a degree program in English at San Jose State University, where he immersed himself in Elizabethan literature. “I liked reading Beowulf and Spenser’s Faerie Queene. When I was young, I played a lot of D&D and listened to a lot of metal and liked fantasy art. So that was what I was naturally drawn to.” At the time, he had no idea that the warriors and Vikings and worm monsters and dragons he was researching for school were feeding the part of his creative brain that would lead him, eventually, back to visual art. After graduating, Michael worked various odd jobs, but nothing felt right. So, at age 28, without any real plan, he moved back to Los Angeles to figure out what to do with his life. While thinking about his next career move, he drew. And drew. And drew. Little bearded men wrestling beavers and fighting sharks. Hybrids of various sea creatures. Eccentric, melancholy monsters rendered in pen and ink. He posted a few of his drawings on social media and, out of the blue, received an email from a gallery, asking to see more of his work. Michael’s first group shows resulted in collaboration requests with ad agencies and brands, and his career as an artist took off from there. His following grew, as did his perfectionism, borne from the lingering insecurity he felt from not having gone to art school. Showing work alongside his contemporaries compelled him to tighten up his craft, make his lines as clean as possible. As much as not being formally trained had affected his confidence, it also worked in his favor. “It was super scary, teaching myself how to paint. I had a lot of questions. But luckily for me, I had friends to answer them. And my sister. She helped me really figure it out for myself.” Thanks to a combination of community and courage, Michael quieted his own critical mind and committed to life as an artist. While Michael may have taken a somewhat circuitous path into art, he has no doubt that’s what helped shape him into the artist he is today. “If you’re just coming from an art background, you can end up sort of self-referential. But if you’re into other stuff, it kind of seeps in. It adds another layer that can make the work more interesting.” Being able to pull from his experiences—whether it be the skater culture he was part of as a teenager, or the gods and monsters he studied in college—has allowed Michael to create a style of art that is uniquely his own. "On the escape of the merboy from those predatory poachers who would do him harm and sell his skin." "Art by Pacolli and some photographs of my wife Rachel and me." "Skull back patch by Matt Johnson." "Ceramic dog guarding some of my favorite books."